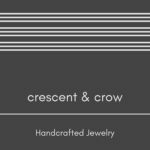 Welcome to crescent & crow! Here you will find modern and delicate jewelry. Each piece is designed and crafted, by us, at our studio right here in Pitman. Come and visit us, we would love to help you pick out your perfect piece.